From the chloride ion content profile, the chloride ion diffusion coefficient can be estimated in accordance with ASTM C1556 or NT Build 443 and used for estimating the remaining service life. 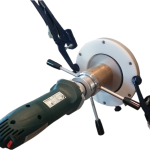 A grinding bit, 18 mm in diameter, grinds the concrete to a fine powder at exact depth increments, which can be selected between 0.5 mm to 2.0 mm. 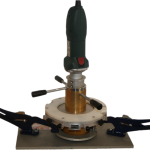 The bit is attached to a grinding machine that is held against the surface by a grinding plate. Grinding is accomplished by rotating the grinder within the grinding plate so that the bit removes a circular portion of the surface. 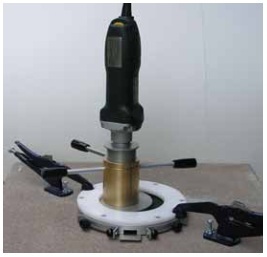 The grinding area is 73 mm in diameter and the maximum depth is 40 mm. 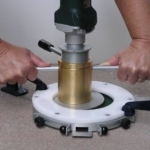 For horizontal surfaces, the powder produced at each depth increment is collected with a battery-operated vacuum cleaner (Dust Buster) containing a re-usable filter. 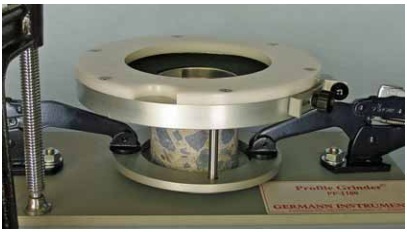 On a vertical face, the powder at each depth increment is collected in a plastic bag attached to the grinding plate, as shown to the right. For every depth increment of 1 mm, approximately 9 grams of powder is obtained for analysis. It takes 4 to 6 minutes to obtain each sample and about 5 minutes to determine the chloride content using the RCT Kit. 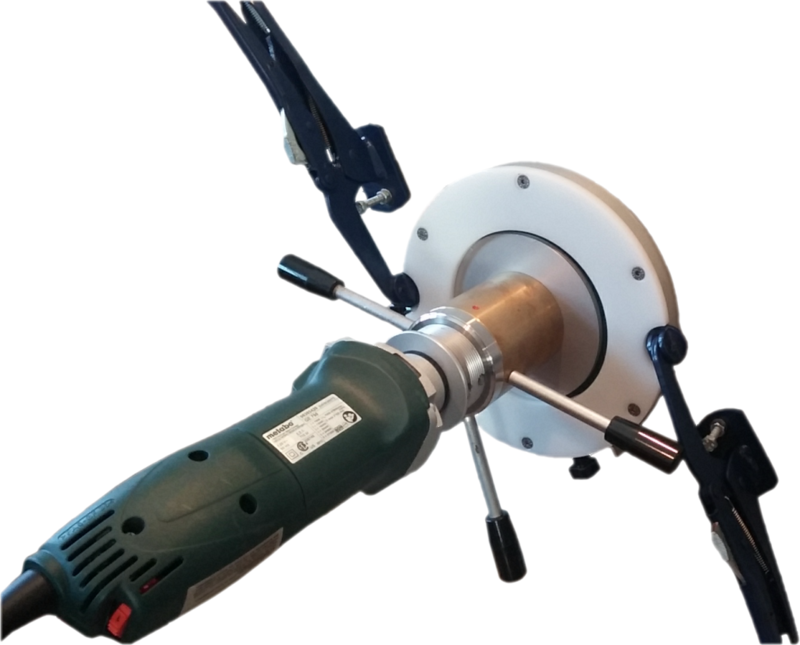 The Profile Grinder can be attached to horizontal and vertical surface using anchor bolts and clamping pliers as shown in the above photographs. 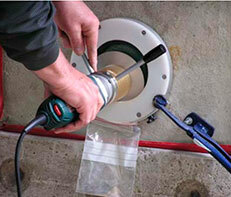 In addition a grinding bench plate is available to permit profile grinding of small specimens. These can be specimens molded in the laboratory and used in diffusion testing such as ASTM C1556 of NT Build 443, or cores drilled from the structure. 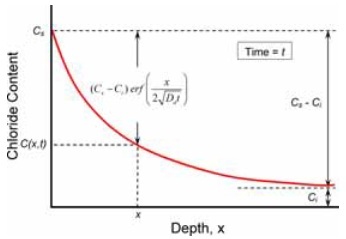 Equation (1) describes the variation of chloride ion content as a function of the distance x from the surface after an elapsed time t since initial exposure to a constant surface chloride concentration of Cs. This function is shown as the red curve in the above figure. The values of the equation parameters ( Cs, C i, and Da) are determined using least-squares curve fitting, which can be implemented using the “Solver” function in Microsoft Excel or using statistical software that permits general non-linear regression analysis. The value of Ci will be zero (0) if there is no background chloride present initially in the concrete. 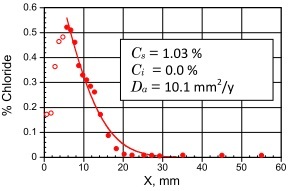 The diffusion coefficient in research reports is reported often in units of 10-12 m2/s. To covert to units of mm2/y, multiply by 3.15576 × 1013. For good quality concrete, typical values of the chloride diffusion coefficient are 10 to 100 mm2/y. 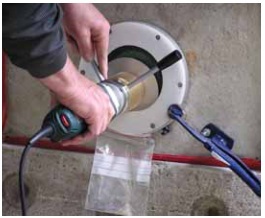 A common application of the Profile Grinder is to obtain powder samples from existing structures to establish the exiting chloride profile. If the structure has been exposed to moist conditions so that diffusion has been the primary transport mechanism for chloride ions, Eq. (1) can be fitted to the data to obtain an apparent chloride diffusion coefficient. If it is assumed that the surface chloride concentration and diffusion coefficient do not change in the future, Eq. (1) can also be used to estimate the chloride ion content at the depth of the reinforcement at a particular time in the future. 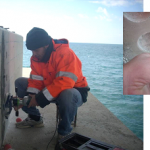 Thus it is possible to determine at what time t, the chloride content at the depth of the reinforcement would reach the chloride ion threshold for initiation of corrosion. There is no single unique value for the amount of chloride ion in concrete that will breakdown the protective oxide film and initiate corrosion of steel reinforcement. The value depends on the exposure conditions, the water-cementitious materials ratio, and the types of cementitious materials in the concrete (1,2,3). The figure to the right shows an equation for estimating the chloride ion threshold based on the exposure condition and the amounts of cement (C), water (W), fly ash (FA), and silica fume (SF) in the concrete (1). 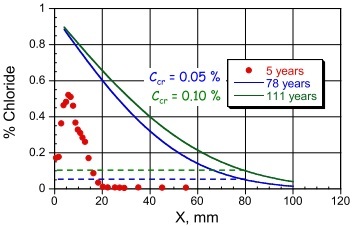 For example, for a concrete with w/cm = 0.4, with 15 % of the binder being fly ash and 5 % being silica fume, and exposed to a splash zone, the chloride ion threshold is estimated to be about 0.23 % of the mass of the binder. In the literature, the threshold chloride ion content may be expressed in different units. In the U.S., it is commonly expressed in terms of mass of chloride per unit volume of concrete. In Europe, it is commonly expressed as a mass percentage of chloride per mass of binder (the cementitious materials). The chloride ion content measured with the RCT Kit or the RCTW Kit is in terms of mass percentage of chloride per mass of concrete. To convert from a threshold value expressed as a mass percentage of binder to a value expressed as a mass percentage of concrete, it is necessary to multiply the former by the ratio of binder content (in kg/m3) to the density of the concrete. For example, if the binder content is 450 kg/m3 and the concrete density is 2250 kg/m3, a threshold chloride ion content expressed as 0.23 % of binder would be 0.23 (450/2250) = 0.046 % of the mass of concrete, or approximately 0.05 %. 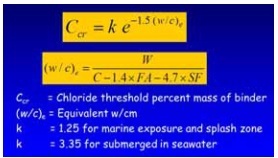 The following example illustrates the analysis of the chloride profile obtained from a structure exposed to the marine environment for 5 years. 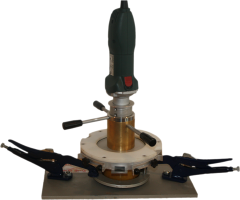 The Profile Grinder was used to obtain powder samples at approximately 1-mm depth increments. 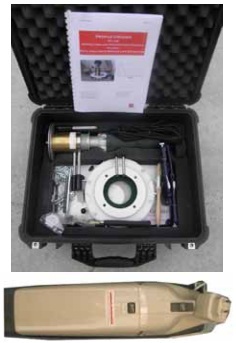 As the powder samples were obtained, chloride content was determined on site using the RCT Kit. The data points in plot on the right show the measured chloride content profile expressed as % mass of concrete. It is seen that the points within the outer 5 mm show less chloride than expected based on the diffusion model given by Eq. (1). Several explanations have been proposed for this behavior, such as washout by exposure to rain and an interaction effect due to carbonation. In any case, the data points shown as open circles were neglected in doing the least-squares regression analysis to obtain the best-fit values of the three parameters in Eq. (1), which are shown within the box. It is seen that background chloride content is 0 % and the apparent chloride diffusion coefficient is 10.1 mm2/y. The nominal depth of cover for the structure is 80 mm. Based on the assumption that the surface chloride ion concentration and chloride diffusion coefficient do not change with time, calculations can be done to estimate the remaining service life, which is defined as when the chloride content reaches the threshold value at the cover depth. Two values of threshold chloride concentration were used 0.05 % and 0.10 %. By trial and error, the exposure time, t, was determined when the chloride content at x = 80 mm would reach the threshold values. The results are shown in the graph on the next page. Thus it is concluded that the remaining service life is in the range of 80 to 110 years. In practice, the chloride profile in the structure should be reevaluated at regular intervals in the future. 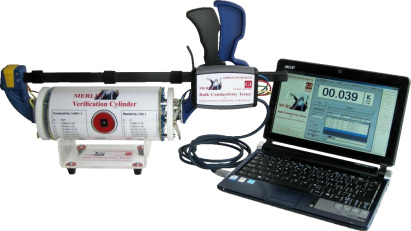 This will allow updating the effective chloride ion diffusion coefficient and calculating a new expected service life.